You use the Office 365 admin centre to enable and configure Microsoft Teams for your organisation. 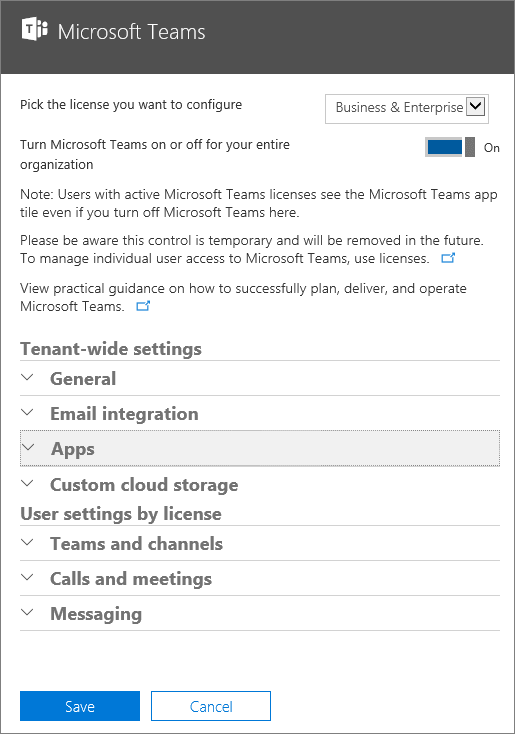 IMPORTANT: All settings are tenant-wide and affect everyone in the organisation who has an active license for Microsoft Teams. To manage per-user licenses for Microsoft Teams, see Turn on or turn off Microsoft Teams licenses. Choose Admin to go to the Office 365 admin centre. 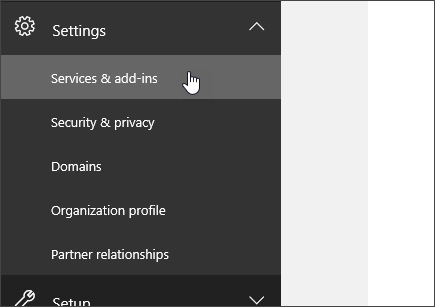 Go to Settings > Services & add-ins. On the Services & add-ins page, choose Microsoft Teams. On the Microsoft Teams settings page that opens, click or tap to switch the toggle to the On position to turn on Teams for your organization, and then choose Save. On the Microsoft Teams settings page, in the General section, you can choose if you want to show an organization chart in user profiles. By default, this setting is turned on. To change this setting, click or tap to switch the toggle next to Show organization chart in personal profile to Off or On, and then choose Save. A team is designed to bring together a group of people who work closely to get things done. Teams can be dynamic for project-based work (for example, launching a product or creating a digital war room). Or, teams can be ongoing, to reflect the internal structure of your organization. Channels are subcategories of teams. You might create a channel for an activity or for a department. Conversations, files, and notes are specific to each channel, but all members of the team can see them. 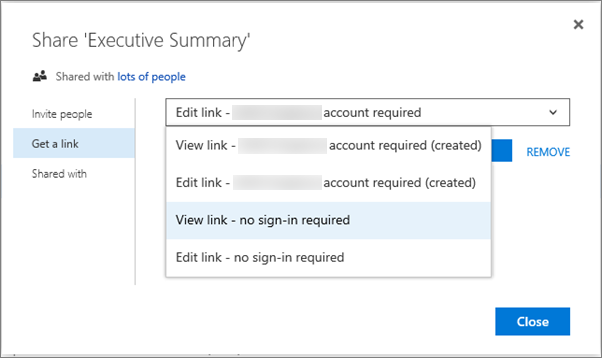 As an administrator, you can manage team owners and members by using the Groups control panel in the Office 365 admin center portal. 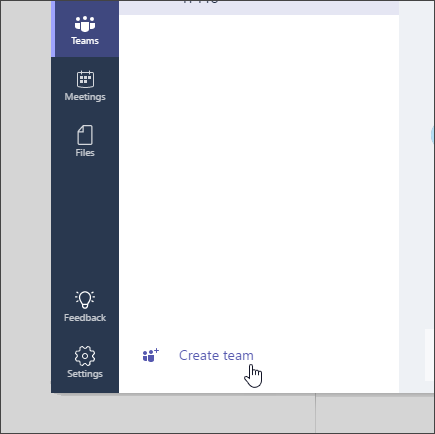 At this time, you cannot create teams from the Groups control panel – teams must be created by using the Microsoft Teams desktop client or web app. 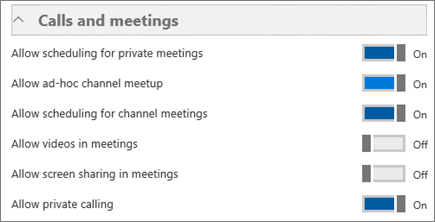 For more information about managing Office 365 Groups, see Create an Office 365 Group in the admin center. Users can create teams by choosing Teams on the left side in the Microsoft Teams client (desktop or web app), and then choosing Create team at the bottom of the client, below the team list. As an admin, you can control which users in your organization can create teams in Microsoft Teams. 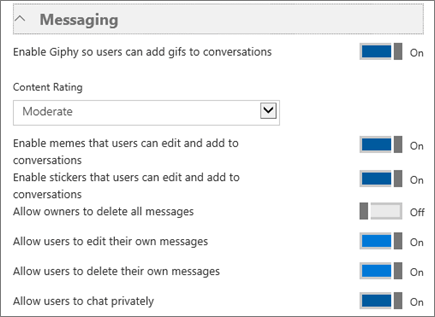 The same creation settings defined by Office 365 Groups apply to Microsoft Teams. By default, every user has the ability to create a team or group. 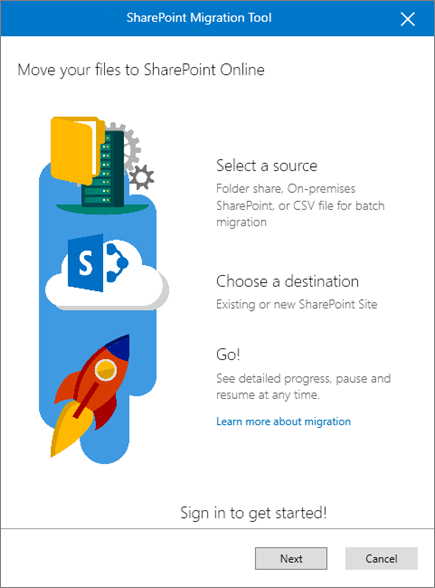 For more information, see Manage Office 365 Group Creation. Microsoft Teams includes calling and meeting capabilities, with support for video and screen sharing. Some companies may want to turn off those features. On the Microsoft Teams settings page, in the Calls & Meetings section, you can choose if users can use video and screen sharing during calls and meetings. As a tenant admin, you can turn on or turn off media content such as animated images, memes, and stickers in the Messaging section of the Microsoft Teams settings page. To turn on or turn off animated images, click or tap the toggle switch next to Add fun animated images to the conversations, and then choose Save. To turn on or turn off custom memes, click or tap the toggle switch next to Add customisation images from the Internet, and then choose Save. To turn on or turn off stickers, click or tap the toggle switch next to Add editable images to the conversations, and then choose Save. Tabs let you customise a channel to include content and capabilities your team needs every day. They provide quick access to frequently used documents and cloud services. In the preview release, there are several built-in tabs such as Files and Notes. In the Microsoft Teams client, at the top of the channel, users can add tabs for Word documents, PowerPoint presentations, Excel spreadsheets, OneNote notebooks, Power BI reports, and plans from Planner. Over time, more tabs will be added, both from Microsoft and from partners. Team owners can also side-load tabs so they appear in the Tab gallery for that team. And developers who create line-of-business (LOB) applications can also use the side-load capability to test their applications in test teams that they create. To turn on or turn off support for tabs from partners and support for side-loading of applications, in the Tabs section of the Microsoft Teams settings page, click or tap the toggle switch next to Enable extension tabs in Microsoft Teams, and then choose Save. Changing this setting does not turn off the built-in support for default tabs, including Microsoft Office files, OneNote, Microsoft Planner, and SharePoint document libraries. For more information about building custom tabs or integrating an existing tool as a tab, see Getting started with tabs for Microsoft Teams (preview). Developers can also learn more from Office Dev Center – Microsoft Teams. Microsoft Teams users can complete tasks such as querying information and performing commands by using bots. You can also integrate your existing LOB applications with Microsoft Teams by using a bot. To turn on or turn off any built-in bots, in the Bots section of the Microsoft Teams settings page, click or tap to switch the toggle next to Enable bots in Microsoft Teams to help users complete more tasks easily, and then choose Save. Changing this setting does not turn off the availability of T-Bot, the built-in help bot. To prevent or allow side-loading of proprietary bots, click or tap to switch the toggle next to Enable side loading of external Bots, and then choose Save. If you’re interested in building a bot, see Creating bots for Microsoft Teams (preview). It has step-by-step instructions for getting started with writing bots for Microsoft Teams. Developers can also learn more from Office Dev Center – Microsoft Teams. NOTE: For developers to be able to test bots in Microsoft Teams, you must turn on bots. 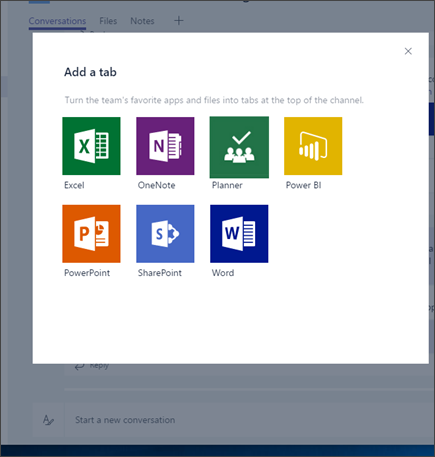 Office 365 Connectors allow your Microsoft Teams users to receive updates from popular services such as Twitter, Trello, Wunderlist, GitHub, and VSTS, within the chat stream in their team. Connectors also provide a way for developers to integrate with Microsoft Teams by building custom connectors to generate rich cards within channels. 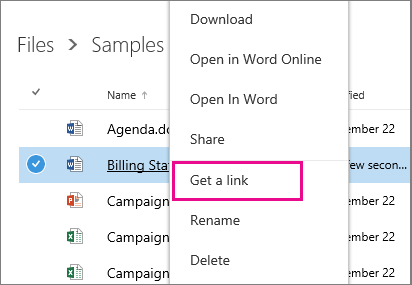 See Getting started with Office 365 Connectors for Microsoft Teams (preview) and Connect apps to your groups for more information. Developers can also learn more from Office Dev Center – Microsoft Teams. The installers for the Microsoft Teams Windows and Mac desktop clients can be downloaded from https://teams.microsoft.com/downloads. End users on desktops can install the application if they have the appropriate permissions. Admins can also download the installer and distribute it through client distribution tools. End users who are using mobile devices can download the Microsoft Teams app from their mobile platform’s app store.Microsoft Teams is available on Windows (Windows 7 and later) and Mac desktop (Mac 10.10 and later). It is also available on iOS v9 and later (iPhone and iPad), Android 4.4 and later, and Windows Phone 10.0.10586 and later. Microsoft Teams is not available via a mobile web browser – it is available only through the mobile app. Microsoft Teams supports the web client on Microsoft Edge 12+, Internet Explorer 11+, Firefox 47.0+, and Chrome 51.0+. Users who try to open the Microsoft Teams web client on Safari are directed to download the desktop client. Support for Safari is coming at a later date. As an Office 365 administrator, you can manage user access to Microsoft Teams licenses in the Office 365 admin center. You must be an Office 365 global administrator or user management administrator to manage Microsoft Teams licenses. To keep a user in your organization from accessing Microsoft Teams, remove the Microsoft Teams license for that user. After you turn off a license, that user can’t sign in to Microsoft Teams. You assign Microsoft Teams licenses the same way you assign any other Office 365 Enterprise license. Sign in to Office 365, go to the Office 365 admin center and, on the Users > Active Users page, assign or remove the Microsoft Teams license. 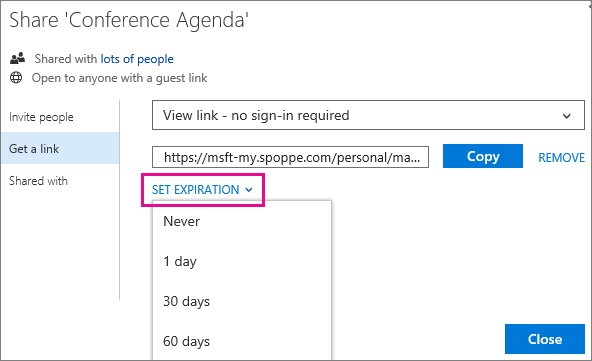 See Assign or remove licenses for Office 365 for business for more information. If you’d rather use PowerShell, see Assign licenses to user accounts with Office 365 PowerShell or Remove licenses from user accounts with office 365 PowerShell. If your organization restricts computers on your network from connecting to the Internet, refer to Office 365 URLs and IP address ranges. This article lists the endpoints that you should include in your outbound allow lists and the Internet Explorer Trusted Sites Zone of client computers to make sure computers in your organization can successfully use Microsoft Teams in Office 365. Microsoft unveiled Microsoft Teams at an event in New York back in November 2016. This is an Office 365 component that adds a group chat tool to the pre existing office suite. Teams isn’t exactly free, but if your organization is already an Office 365 subscriber it won’t cost anything additional. Of course, that doesn’t mean it’ll just pop up on your desktop the day it launches. Like any Office component, it’ll be up to your company’s IT department whether or not to deploy it to users in the organisation. Microsoft Teams is, at its base, a chat-centered team workspace that’s easy to set up. Once your team is on board (and you can have multiple, different teams), you’ll have different channels within the teams for specific conversation topics. What’s more, you can even chat with members individually. Not only can you like posts, mention people, reply directly to posts, and even save posts, you can also post in rich text formats (including subject lines, bullet points, images, etc.). The addition of emoticons, gifs, and stickers make this platform a friendly, informal way for teams to chat. It makes it a much more personal and enjoyable experience than having a bland email chain. 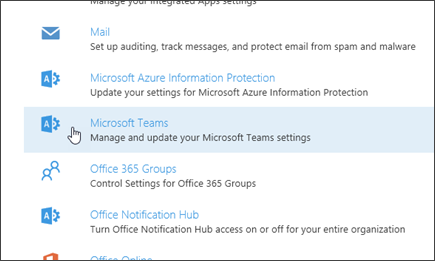 Teams is based on Office 365 Groups. Every time you make a team, it syncs and creates a group in SharePoint Team Sites. This allows Microsoft Teams to easily integrate to OneNote, Planner, Exchange Calendar, and all sorts of files to make sharing within your team the simplest it can be. Let’s say you share a file in a channel with your team. That file will automatically be uploaded to a folder specific to that channel. The folder contains all the uploaded files of that channel, and can easily be found in Teams for later use. With the simple click of a button, within the chat itself, you and your team can have an audio or video meeting. Not only can you schedule these meetings, you can make them happen with no preparation by clicking the button, and having whoever is available join. Since Teams is a flexible app, you can just as easily do this from your desktop or your mobile. You and your teammates can easily share notes and files during the meeting as well. Once the meeting is over, you can find a record of it saved in the chat history for future reference.